What I’ve been up to lately…..
I’ve broken my arm. I was running for a bus, tripped, caught myself with my left hand. Thanks whoever is out there, it was my left. But in the meantime, my artwork has slowed considerably. Yes, but I can surely draw with my right hand, right? Yes, but….I do my most careful work on carefully cut large paper.which requires two…count’em, two hands. So, I have been active doing note cards. I’ve produced very little that was outstanding. 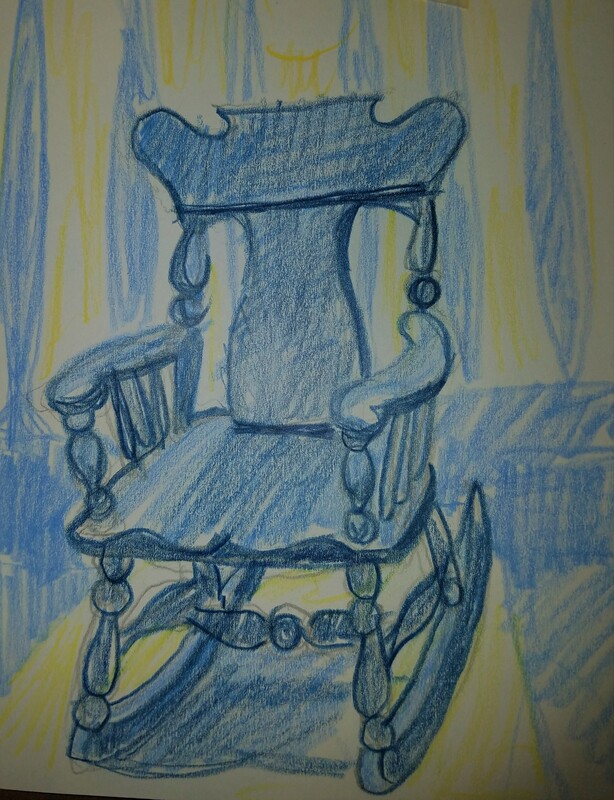 Still, today, I was playing around with a sketch of a rocking chair, just to keep my drawing active. I came up with something that has some possibilities…..here’s the sketch, and since it’s a sketch it’s pretty rough…but you get the idea. Previous PostA Winter’s Tale…Next PostI’m about to do it, again. Oh Roxy!! I am SOOOO sorry to hear you broke your arm, how awful!! Are you feeling ok? When did this happen? ?